Today’s post was originally published on September 9, 2015. “When was the last time someone offered to carry your book to school?” This question was posed by Apple in a 1999 advertisement to introduce the iBook, the company’s new peppy line of laptop computers geared towards entry level, consumer, and education markets. The advertisement pictured the user’s hand wrapped around a turquoise carrying handle that supported a clamshell-shaped laptop edged in the same bright hue. The built-in handle, in addition to the computer’s vibrant color and new wireless technology made it the most coveted back-to-school accessory on college campuses that fall. At the time Apple’s catchphrase of “Think different” summed up the fresh attitude of this new design that brought a pop sensibility and a cheerful attitude to counter the still bulky machinery of the personal computer. The use of neon-colored transparent plastic housing turned the computer into a large gemstone or a candy-coated treat, lending levity and joy to the work-related function and associations of the personal computer. At first released in only in the colors blueberry and tangerine, later in the series Apple added indigo, graphite and key lime. In another early ad one tangerine laptop stands open and propped up on its edges above the phrase “Looks are not the only reason why the iBook is the habanero of notebook computers.” The iBook offered an unprecedented six hours of battery life and promised to be “out of the box and onto the Internet in ten minutes” due to its innovative wireless capabilities. 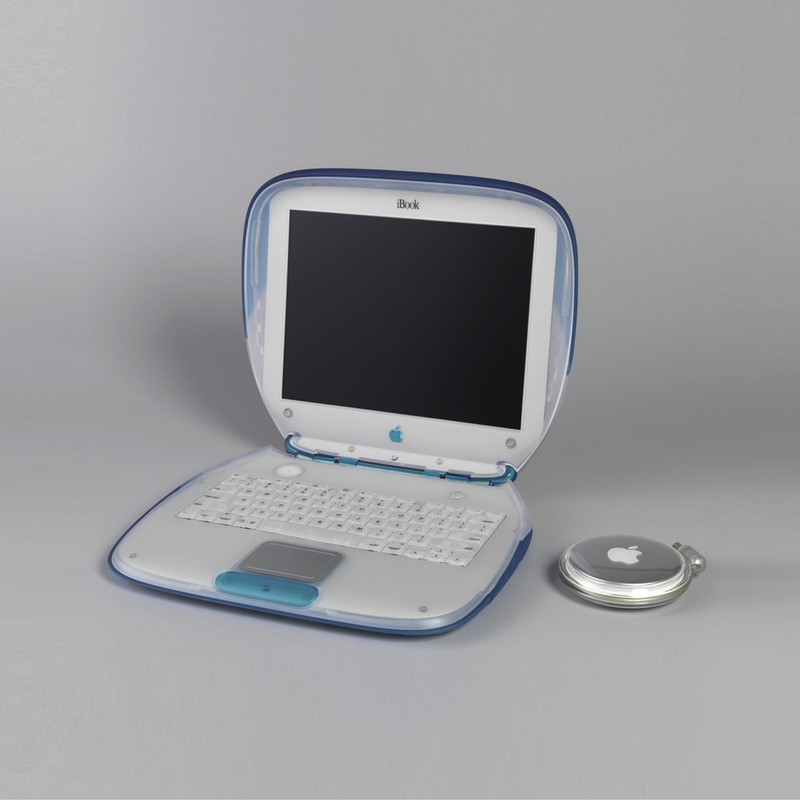 The iBook was the first mainstream computer designed and sold with integrated wireless networking. Apple continues to build a successful business through an effective marriage of bold styling and up-to-the minute technology. With education pricing and new product lines regularly released in the fall semester, Apple’s timing and business strategy reflect that the back-to-school season remains one of their strongest. Apple was the winner of the National Design Award for Corporate Achievement in 2000. I want to know more about that little compact looking object.